RUSH: Here’s Danny in St. Louis. Danny, welcome. I really, really appreciate your patience in holding on. And how are you doing? CALLER: I’m doing wonderful. 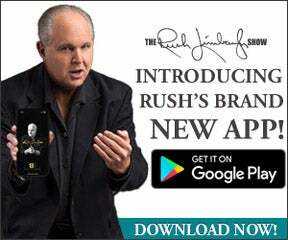 Hey, Rush, I wanted to thank you for the app. I do construction for a living and I don’t always get a chance to listen to you on the radio. And as brilliant as you are, listening to your comments, it’s just as equally brilliant to read it on the app. I just want to thank you. And your transcribers do a great job. RUSH: Yeah, they are kept very busy. I speak a lot of words. RUSH: We have a transcription team full time just to transcribe everything said on the program today and then we have to edit and correct. I’m really glad that you noted that. And I really appreciate that. RUSH: There’s a lot of work that goes into that. And you know you’ve made another point. When we first upgraded the app and I announced that it was now available, people wanted to know if you had to be a member to use it. I said no, no, there’s all kinds of stuff you can do with this app that doesn’t cost a thing. And among the transcript of everything I say, you just made the point, sometimes you hear it but you can’t remember it all. You get the transcript and you can revisit, read it as many times as you need to get it down pat and then you can share it. You can share it however you want with social media or email or via any kind of messaging app if you want for somebody else that didn’t hear it. And it’s almost a way of creating a miniature social network among users of the app and that is one of the true valuable aspects of it. And it doesn’t require membership to be able to have access to every transcript. Imagine — Danny — the transcript of this program today is a gold mine, for example. RUSH: I guarantee you, most of the time it’s true, things said on this program are not said very many other places. We don’t follow conventional wisdom. And so if any of it you really liked and you think others should hear it, all you’ve got to do is go to the app, get the transcript for whatever segment or hour and let it fly. I’m glad you reminded me of that because that’s really important. I’m glad you use it that way, too. CALLER: I do. Thank you very much. RUSH: It’s another benefit too. He says he’s in construction and sometimes can’t take the radio up there on the crane or whatever he’s doing. But with the app, and a pair of air pods, or ear pods, whatever, with the app and your phone, you can put it in your pocket, whatever, and either listen to the streaming of the program or, when you have time, go get the podcast version of the show, which is without commercials. Or you can restream it anytime you want when the program is over, when each hour is over that streams. So, yeah, if you can’t make it noon to three, the app affords you the opportunity to listen anytime. Again, folks, it’s really important to point out that you can do a lot with the app that does not require a paid subscription, including some video highlights of the Dittocam. There are parody videos that are there, there are highlights and outtakes and segments from Rush, the TV Show. There’s a lot that’s on the free side of the app and, of course, at the website as well. And the app is just RushLimbaugh.com in the app store is how you search for it. It looks great. We designed the app to go great on the new iPhone X, but primarily a dark theme. It looks good on any phone, just on the iPhone X the darker the screen, the less battery power you’re using. I won’t go into the technical reason why. Danny, I appreciate it.